Taps are a hard-working essential household item and that's why choosing brassware is an important decision to make, so whether you are thinking of redoing the whole kitchen or bathroom or simply just refreshing a few key areas, we will hopefully give you some inspiration! Mono mixers are an increasingly popular brassware option - it is worth remembering that 'brassware' is a general term for taps and mixers, whether they are made of brass, chrome, stainless steel or another material. They have a single spout with the flow of water controlled by either one or two handles. If the tap is a single-lever mixer, it can be rotated from left to right to adjust the temperature and lifted to increase the water flow rate. These types of taps usually have a sleek and contemporary design and can be a good choice when space is tight. Mono mixers can also have individual taps that control the hot and cold supply separately. There are wider versions of mixer taps available to use for the bath, where the water is visible and flows down into the tub like a waterfall. This creates an aesthetically pleasing and calming effect – perfect for if you like sitting in the bath while it is filling or to top it up with more hot water if you want another hour of relaxation. Whichever designer range takes your fancy, they typically include complementary basin and bath mixers, so you can have a consistent look across all of your bathroom's brassware. 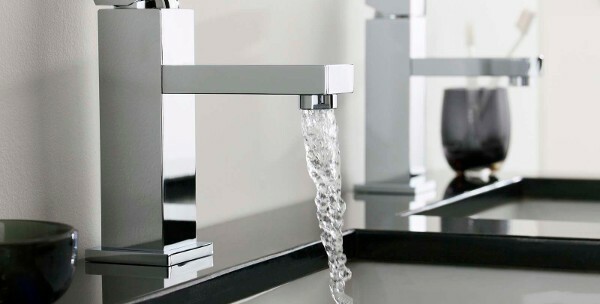 Our designer taps and brassware incorporate the latest modern designs, whether you want the minimalist look of a wall mounted basin or bath filler or the traditional of years gone by, we will be sure to help you find what you are looking for.